Believe it or not, the area to the right of this Forest Hills sidewalk is likely city parkland. Are you responsible for maintaining part of the District’s park system? If you’re a homeowner, you probably are. Majestic views, wide sidewalks, and leafy residential streets are a defining characteristic of Washington, DC, that residents and visitors often take for granted. Our city has not always looked like this. The wide streets and rights-of-way that we enjoy today weren’t always such an attractive amenity. A big reason for the improvement is the DC park land abutting homes and businesses in DC. It’s called “parking,” and it’s legally part of the city’s park and open space system. And it’s attractive today because of the great civic pride of home owners who do their part to maintain the public space in front of their property. We can thank Pierre L’Enfant for our wide streets. The 1791 L’Enfant Plan that established the street network within the boundaries of Florida Avenue had rights-of-way that ranged in width from 90 to 160 feet. The idyllic notion that the broad avenues would be picturesque carriage ways lined with double rows of trees was a nice idea. But in reality these wide streets presented a maintenance headache for the fledgling city and local government. 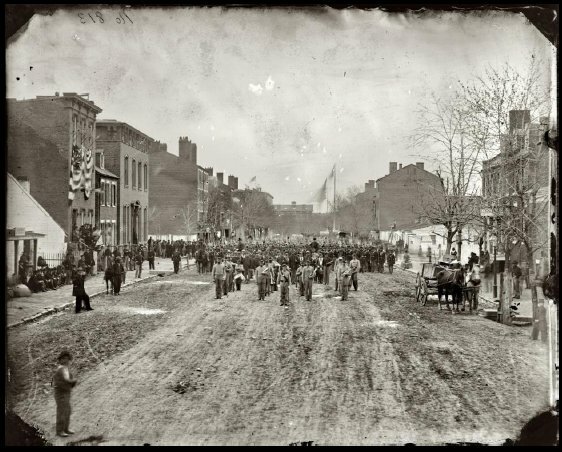 The condition of city streets deteriorated further after thousands of Union troops crossed the city during the Civil War. The streets and avenues of our city of magnificent intentions were really muddy quagmires. To help the city address the overwhelming responsibility of maintaining streets, Congress passed the Parking Act in 1870. This law granted the city the authority to set aside parts of the street right-of-way as park land “to be adorned with shade-trees, walks, and enclosed with curbstones, not exceeding one half the width of any and all avenues and streets in the said city of Washington”. In 1872 the first “parking” was installed on K Street, NW, between 12th and 16th Street, transforming what had been mostly dusty street to a much narrower roadway for carriages lined with sidewalks and park land. That same year, the city’s Legislative Assembly passed a law making the adjacent property owner legally responsible for maintaining the landscaped area. The idea to line the city’s streets with park land quickly took off and park land was systematically added along city streets. The “parking” was extended to the suburbs – the DC residential areas beyond the L’Enfant Plan – through the 1893 Highway Plan. This plan regulated the subdivision of land so that new streets platted by individual property owners were better coordinated. This was prompted by problems associated with the unregulated subdivision of land that had occurred in the area north of Florida Avenue. Anyone who has tried to drive east-west through Columbia Heights has experienced the downside of unregulated subdivisions that included narrow streets that don’t always line up at intersections. The Army Corps of Engineers developed the Highway Plan at the request of the District Commissioners, the three-member body of presidential appointees who oversaw the day to day operations of District government. Between 1893 and 1898, the District Commissioners refined the Highway Plan in consultation with Frederick Olmsted’s firm – the landscape team responsible for New York City’s Central Park. His office was also responsible for designing new residential communities like Roland Park in Baltimore or Riverside in Chicago. These neighborhoods were designed with streets that worked with the existing topography instead of laying down an indiscriminate grid. Olmsted’s office tweaked the Highway Plan by modifying some of the gridded streets so that they followed the topography. This influence can be seen in the neighborhoods between Connecticut Avenue and Rock Creek Park, and in areas east of the Anacostia River. In this example, in an older neighborhood with narrow streets, the public “parking” area (in red) stretches all the way to the top doorstep. The Highway Plan also established a minimum 90’ street width, in part as a way to extend the city’s “parking” system to the suburbs. The Plan was implemented when properties were subdivided; it was at this time that new streets were established and were required to follow the plan. To reduce the amount of land property owners had to dedicate for streets, the city allowed building restriction lines on private property that established areas that were to remain open and that could count toward the 90’ street width. Beginning in 1900, establishing a building restriction line on a street required all of the property owners to voluntarily agree to the building line. This apparently was difficult to do because between 1900 and 1910 Congress passed several bills associated with building restriction lines, giving the District increasing authority to establish them even when property owners did not want to. Building restriction lines made it easier and less expensive to implement the plan. For example, property owners did not have to give up as much land for a street – a 60-foot roadway with 15-foot building restriction lines on either side would add up to 90 feet. There were other planning ideas that established street widths in the Highway Plan that resulted in street and building restriction line widths that varied. 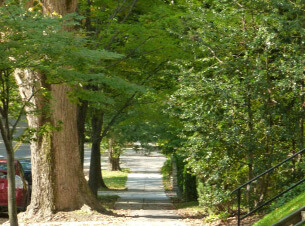 An example of this is Blagden Avenue, NW, that leads from 16th Street into Rock Creek Park. Blagden Avenue has a total width of 110 feet, wider than most streets – a 70-foot street with 20-foot building restriction lines on either side. Blagden Avenue’s wider green space enhanced it as an entrance to Rock Creek Park, and the extra width and “park land” on either side of the road was intended to create more of a park-like character. 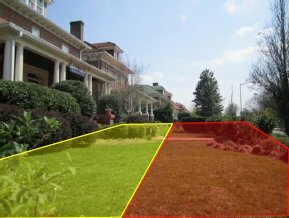 In this example, the area in yellow belongs to the homeowner. The area in red is public property. Public space regulations that guide how the park space along city streets is used and appears reinforce long view corridors, framing vistas, and greenery. These regulations apply to both public space and the building restriction area. Depending on how your street was platted and the location of your home on your property, the space in front of your property could be: 1) public space; 2) private property with a building restriction line; 3) your property because the house was built behind the property line; or, 4) a combination of public space, building restriction area, or private property without a building restriction line. Diagrams that illustrate public space and building restriction lines are included in the District Public Realm Design Manual. Today, the character of our city’s residential neighborhoods is highly influenced by our street widths and the regulations governing public space. They have created a well-designed and maintained public realm that balances the mobility and access needs for all users and contributes to the efficient functioning of a city and its sense of place. 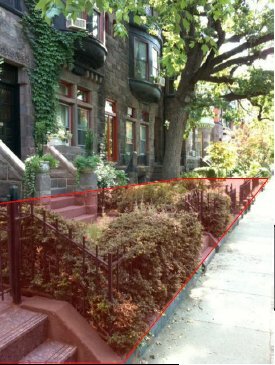 Many of the District’s public space regulations govern the public space between the sidewalk and property line or the area within a building restriction line reflects this principle. The second article in this series will go into the specific regulations that protect the city’s green, park-like and pedestrian-friendly public space. Chris Shaheen manages the DC Office of Planning’s Public Space Program. Chris’ background is in landscape architecture, urban planning, and historic preservation, and he has worked in the private and public sector for over 20 years. Since 2001 he has worked for the DC Office of Planning. He currently represents the Office of Planning on the Public Space Committee and the Pedestrian Advisory Council. Very interesting. For a person with a house, I’d like to see some rules telling what you can and can’t do with the “tree lawn,” and also what is permitted with the space between the sidewalk and the property line. A lot of people don’t know that this is “public space,” and that you can’t build anything on it without a permit from the city. We also need examples on the use of “public space” in a commercial area (like Connecticut) so everyone can understand that restaurants and others have to get a permit to use that space, and the ANC weighs in on the permit. The 2nd in the series will go into more detail on the specific rules. But if you want to learn more before then, check out the Public Realm Design Manual on the District’s website. You can either search under Public Realm Design Manual or go to the link below. This manual has lots of illustrations and includes the public space regulations that are most commonly asked about.